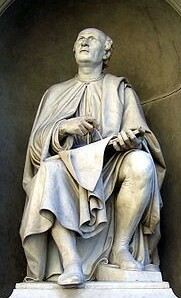 “He was given to us by Heaven to give new form to architecture” said the biographer Giorgio Vasari about Filippo Brunelleschi, who had as a matter of fact started his career as a sculptor: His Crucifixion can be seen inside the Church of Santa Maria Novella and the panel with The sacrifice of Isaac for the competition held in 1401 to appoint the commission of the new Baptistery doors (eventually won by Lorenzo Ghiberti). Whether it was Brunelleschi’s determination to stand out, or his raising interest in mathematics and perspective he decided to devote himself to architecture and his contribution was crucial for the transformation of Florence. Starting from the dome of the Duomo, started in 1418, we follow the details and secrets of the construction in the Museo dell’Opera where the original pulleys and tools have been nicely displayed. In 1419 Brunelleschi started working on the project of the Spedale degli Innocenti, an institute for abandoned children where Filippo proved his ability in creating rational and modern spaces. 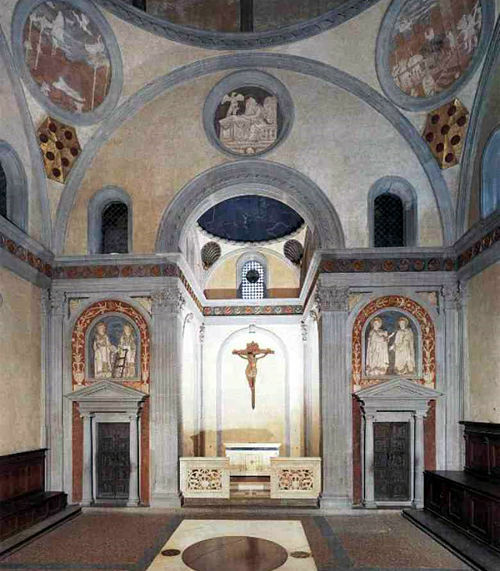 Next step in his career was the Church of San Lorenzo, for the Medici: his contribution was partly misinterpreted after his death but the Old Sacristy is still an example of passion for simple elegant geometric shapes. In order to visit Brunelleschi’s mature work we cross the river and arrive at Santo Spirito: with its forest of grey columns and the majestic proportions this church remains the testament of the artist. To complete this overview we stroll back to the right bank to the Cappella Pazzi in Santa Croce, a timeless masterpiece of classical interpretation. Brunelleschi’s strong authoritative personality generated anecdotes and legends: the most famous was a complex plot to convince a Fat Woodworker he was somebody else so that in the end the man had to leave Florence for good! And finally Brunelleschi’s contribution to Tuscan cuisine: the construction of the dome is traditionally connected with the Peposo recipe: using “cheap” meat, a lot of pepper and abundant red wine the carpenters and furnace workers would stew it for long hours (they also managed to produce and set in place the 4 million bricks on the dome by the way). Peposo is still a typical recipe in Impruneta, the city where terracotta is produced today, but also in Florence when moving from one sight to the other a good peposo dish is surely welcome.